If the recent Sorry To Bother You presents a head-trip, music-video vision of trying to get by in Oakland, California, then Blindspotting offers a more grounded tour of the city, addressing some of the same or related problems: racism, gentrification, systemic oppression. 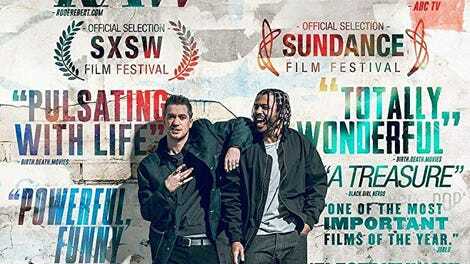 Given the proximity of the two movies both at Sundance and in general release this summer, Blindspotting has every opportunity to look more staid, earnest, and traditionalist in its approach to the subject matter. As it turns out, this may be why such a small-scale, sometimes predictable drama can still feel, at times, downright revelatory: It crackles to life without a surfeit of surface flash. That’s not to say that Blindspotting lacks style or energy. Director Carlos López Estrada indulges in quick-hit close-ups but also frequently lets his camera just linger on best friends Collin (Daveed Diggs) and Miles (Rafael Casal) as they walk around Oakland or goof on each other in a locker room. Despite the jocularity, Collin has to be cautious. He’s staring down the last three days of probation, eager to leave his curfew-dependent halfway house and maybe rekindle his relationship with Val (Janina Gavankar), who also works the front desk at the moving company that employs both Collin and Miles. Collin sometimes has to cover for Miles, who will show up late to work or curse out a well-to-do Whole Foods shopper too focused on his phone to notice when he’s blocked the moving truck in. More urgently, Miles is the type of friend who will buy an illegal firearm out of a car with his on-probation buddy along for the transaction, very much against his will. At first, Casal’s Miles looks and sounds very much like the worst version of the hothead-friend archetype, all loud swagger and decision-making skills calculated to maximize the violence in almost any situation. But he quickly turns into the best riff on Johnny Boy in ages, thanks to two key decisions made by the screenplay. First is the strong presence of his wife, Ashley (the wonderful Jasmine Cephas Jones), both loving and wary of a character who would, in a less nuanced movie, keep company with vengeful strippers or other crime-movie caricatures. Second and more important is the dynamic between Collin, a black man trying to keep his life on track, and Miles, a white guy who takes a lot of pride in his hardscrabble Oakland upbringing but can’t erase the fact that his skin color gives him certain advantages—especially in his chosen field of acting like a jackass. He’s also free to complain about the gentrification of Oakland, while Collin appears to consider the advantages of being able to buy overpriced health-food juices and not find himself in the midst of probation-threatening gun deals. Collin also has to deal with a lot more police harassment than his shadier buddy. The freedom gap between them informs the incident that hangs over the movie, even though it doesn’t directly involve Miles at all: In a brilliantly staged scene that creeps forward from his impatience at a seemingly endless red light, Collin suddenly witnesses a police officer shoot a young, unarmed black man. He’s urged onward by the cops, but spends much of the movie simmering with rage over the injustice, fear of what could happen to him if anyone realizes he was on the scene, and a big dose of PTSD. This all makes Blindspotting sound psychologically grueling, and it often is, but this is also a funny, sometimes oddly warm movie. The way that, say, a crucial and traumatic flashback scene has the frame of an amusingly embarrassing story (complete with actual, discomfiting laughs) makes the harrowing stuff even scarier, toggling between the two with a nimbleness that recalls Spike Lee at his best. Lee’s influence also hangs over the movie’s occasionally awkward weave through the key details of its Oakland portraiture and the dramatic inevitabilities of its broader aims. Diggs, best known for his terrific work in Hamilton on Broadway, sometimes tilts a little theatrical in his emotional scenes, and Casal has the kind of showboating role that encourages overacting, even in a more shaded incarnation. But both actors also know how to modulate their performances; Diggs in particular frequently eases back into a deadpan mode, making Collin both a lightly comic hero and a tortured soul. Diggs, Casal, and Estrada are all walking on a high wire here, requiring a balance so delicate that it may not be visible to some of the audience until they have to decide for themselves whether Blindspotting’s leap-of-faith climax works. Even those taken aback may be forced to admit that the movie has earned their trust.